American consumerism is an extremely powerful cultural force; the concept of buying toys for one's own pleasure is an easy sell all over the world. As we've noted earlier, the Japanese economic miracle depended on the hard work and self-sacrifice of the entire population; when the government officials stopped setting an example of altruistic hard work, the economy went down and stayed down. A video of two young women looting with gay abandon during rioting in the Serbian capital Belgrade was becoming a Balkan smash hit on the video-sharing Web site YouTube Friday. "Get lost, stop filming," one of them shouted, so laden down with booty that clothes and bags dripped to the ground amid the broken glass below emptied storefronts. The ostensible reason for the riot was American and European support for Kosovo's independence. Yugoslavia was held together by fear while Tito was alive, but when he died in 1980, the country soon fell apart in war, ethnic cleansing, and a host of other horrors. Serbia effectively lost Kosovo in 1999 when Mr. Clinton persuaded NATO forces to bomb Serbian forces under Slobodan Milosevic. The Serbs were trying to purge Kosovo of ethnic Albanians (WSJ 22 Feb 2008 p A12); their efforts led to Mr. Milosevic being tried as a war criminal. Yugoslav unity has been so weakened by the ethnic wars of the 1990's that most of the looters are too young to remember Yugoslavia ever being united. Was this really a nationalistic riot? Have consumerism and greed become a pretext for rioting? The looters continued even after they knew they were being filmed. Is there no sense of shame, no fear of the police? A sense of nationalism may have sparked the riot, but consumerism certainly gave it legs. This phenomenon of relatively wealthy people rioting is one aspect of the "revolution of rising expectations." This theory is based on the observation that when people are extremely poor, they spend all their energies working to find the next meal. As people become a little better off, however, they start to focus more on what they don't have than on what they do have. This is particularly acute when people have access to the Internet and to Western TV and can see how much better off other people are than they perceive themselves to be. Consumerist envy begets a form of entitlement, "I'm just as good as those people, I ought to have what they have." One of the major factors behind the fall of the Berlin Wall was that the East Germans could watch West German TV and see how much better off workers were in the capitalistic part of their country. Consumerism is also one of the reasons fundamentalist Islamic leaders are so down on America. Osama bin Laden gripes about our soldiers hanging around the Muslim holy sites in Mecca and Medina, but he also disapproves of our self-centered, materialistic culture. He knows very well that as people become addicted to DVDs, iPods, and other American-generated artifacts, they become less and less interested in the more ascetic, self-denying aspects of Islam. One of the reasons the al-Qaeda forces in Iraq have encountered difficulties is that Iraqis don't take kindly to having their fingers cut off as punishment for smoking. 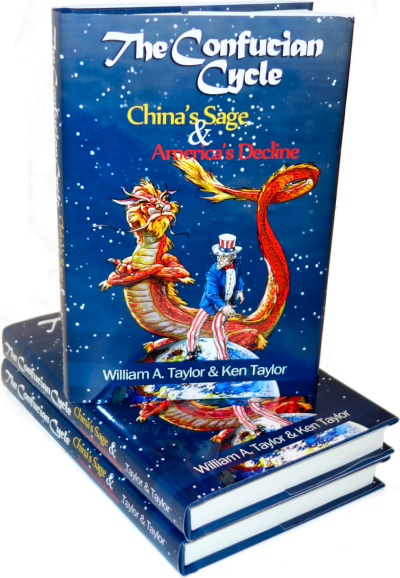 When a society becomes wealthy, history shows that it starts to slide into the down-side of the Confucian Cycle as people stop contributing as much to society at large. As any grandmother will tell you, when a husband and wife become more concerned with taking out of the marriage than with putting into it, divorce follows. Similarly, when most members of society spend more effort taking out than putting in, collapse follows. Are these hedonistic rioters the wave of the future? "Are these hedonistic rioters the wave of the future?" Dear Lord, I hope not. The bigger question is whether Serbia will now join the growing list of anti-Americans around the globe. We are partly to blame for our role in messing with their affairs.